I stopped doing traditional jigsaws long ago - as most of you probably did. Once you get to a certain age the mere mention of the word "jigsaw" conjures up images of little old ladies, or sad middle-aged couples who are called Dennis and Marjorie. Move over saddos, because there is a new puzzle in town and it's one that is way too hip for the pullover brigade. 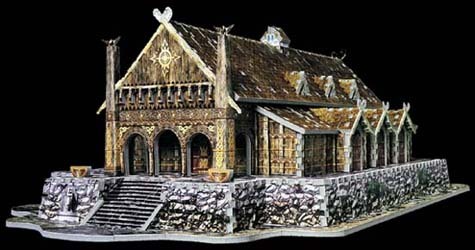 The Golden Hall (from the Lord of the Rings: The Twin Towers movie) puzzle consists of 700 foam backed pieces and is a beautifully detailed replica (just look at the quality of the image below to see how detailed it is) of the building that features in the movie. This puzzle was highlight as being of average difficulty by the manufacturers guidelines on the back of the box - I'd hate to see how difficult their hardest puzzles are! The Golden Hall was hard to complete - we had five pairs of hands - but (and I shudder to say this about jigsaw puzzles) great fun. Another huge advantage of this format is that, because it is constructed on levels, you get more pieces taking up a smaller footspace. 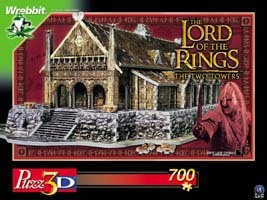 So, while there are 700 pieces, it takes up a lot less space than a flat 700 piece puzzle would. I had a couple of slight complaints, and these are very small moans. When the box is first opened there are lots of pieces that are stuck together in groups of twos threes and even fours and it is a bit of a pain to unhook them all (you'll be tempted to leave them there to make life easier, but don't). And there are also a load of pieces that can't be used in the puzzle. These are indicated with red spots, but there seemed to be so many of the things and we ended up putting some of the useful pieces in the pile of useless ones by mistake. But the alternative is that someone in the factory goes through and sorts out these problems on every puzzle produced. That would be too costly and the inconvenience to the user is only slight. While this is hard (well it was for us) the end result is well worth it. The only problem is that there will be tears when we have to take it down. The blood, sweat, tears and tantrums expelled from five members of our editorial team were not in vain - it looks stunning. I am now a convert. You'll find me wearing a cardigan and corduroy trousers any day now. Puzz 3D has done for the jigsaw market what talkies did for the movie industry - brought it back from the brink of dullsville.